In fifth grade, my class did a social studies unit on Greece, which culminated with a group meal. For dessert, we made baklava. Its rich and sweet layers of flaky phyllo dough, butter, honey, and nuts made an impact on me — and my taste buds. I didn't make the decadent delicacy again until a couple of years ago, when my mother requested a Middle Eastern birthday dinner. My sister and I pored through our cookbooks, finding all sorts of delicious things to make. For dessert, I chose baklava. For that meal, I put a few twists on the dish. My sister and mother are not overly fond of walnuts, the traditional nutty filling for baklava. Pistachios, though? That's another matter. And instead of honey syrup, I used a secret weapon — orange blossom syrup, made with sugar and orange blossom water, which you can find on Amazon or at a Middle Eastern market. The ingredient adds a floral sweetness that's really incredible. 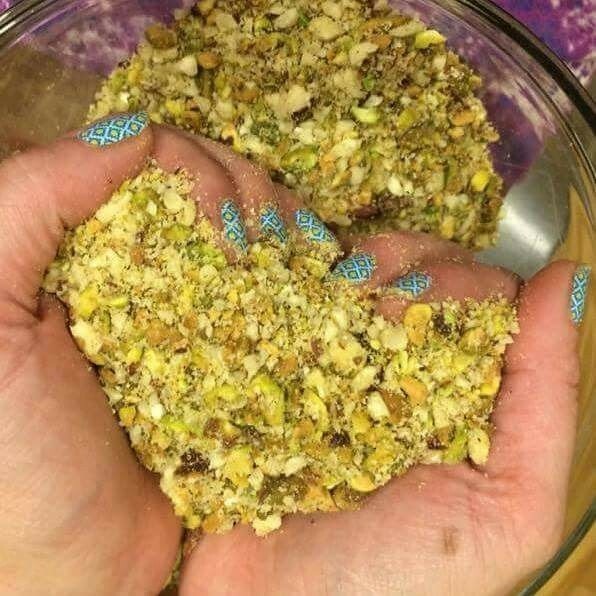 For this recipe, I used chopped pistachios and pecans, as the mixture is more affordable than just pistachios. Really, you can try any combination of nuts — walnuts, of course, would be wonderful, and hazelnuts would work, too. Don't be scared to play around! 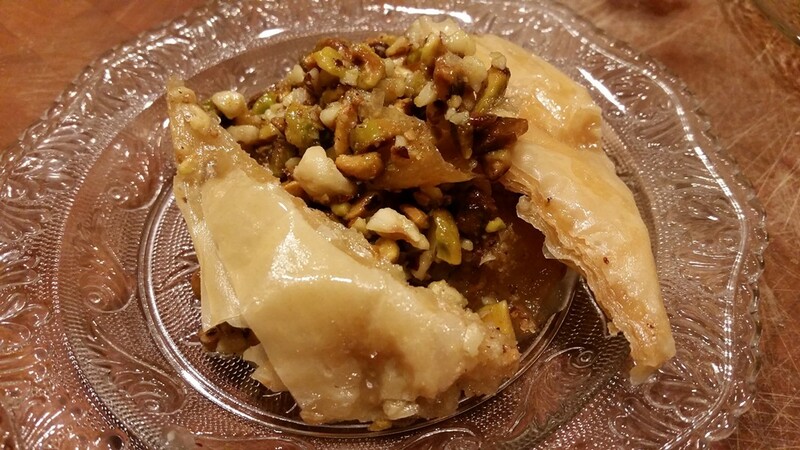 The real magic of baklava happens when you pour the warm syrup over the baked layers of phyllo and nuts. It sizzles in the most satisfactory way as the syrup works its way into all of the crevices of the phyllo. The end product is a sticky, sweet confection that is undeniably delicious. 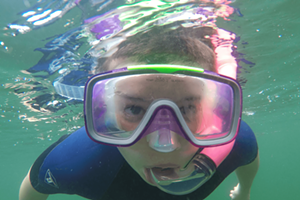 Kids love it, adults love it, and the whole process is a whole lot easier than you'd think. This is one to try at home, if for no other reason than that magic sizzle. Brush a little melted butter on the bottom of a 13"-x-9" pan. Lay down a sheet of phyllo, then brush with a little butter. Lay another sheet on top, and brush with butter. Continue layering phyllo and brushing with butter until half the phyllo is used. Layer the remaining phyllo on top of the nuts, brushing each piece with butter once again, until all of the phyllo is used. Trim the edges to get rid of any excess phyllo. Brush the top layer with butter. Then, using a sharp knife, cut diagonal parallel lines through all the layers to form triangle-shaped portions. Bake, uncovered, for 50-60 minutes, until lightly browned. Meanwhile, make the syrup. In a heavy saucepan, mix together the sugar and the water. Stir constantly until the sugar is dissolved and the syrup comes to a boil. Reduce the heat, stir in the orange blossom water and cardamom. Simmer for about 15 minutes, until slightly thickened. Leave to cool slightly while the baklava finishes baking. 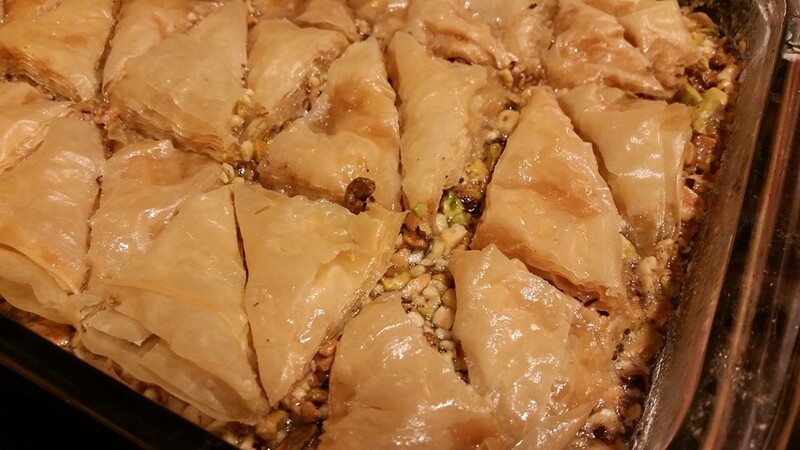 When the baklava comes out of the oven, pour the syrup over the piping hot pastry. Put the baklava back into the oven for 3 to 5 minutes to help the syrup to soak in.